There is no greater vice than impatience. Time and time again, I have heard how humans have had to pay a great price for this vice. Be it in war, governance or infraconstruction; impatience has cost organizations a fortune. In the infraconstruction industry, I have seen, municipalities have been the most impatient of all. Even until now, they seek to reduce infrastructure costs by cutting costs at every corner they can. Just like contractors cut materials on every nook and corner to save extra money; municipalities attempt save on each and every phase of construction; right from design to project completion, without realizing that the only way to achieve this, is by reducing project’s quality. They demand the designer and contractor to develop lean methods to complete projects at reduced prices, but forget that the only way for them to do so, is by lowering their work’s quality. Because after all, contractors never accept risk; they only price it. They also forget, that this low quality work will not only cost them today, but also tomorrow. Because a project built today will need maintenance for another 50-60 years. Just like the human body requires constant nourishment throughout its life to keep it fit, healthy and free of diseases. Similarly, an infraconstruction project after being built, requires constant maintenance to keep it functional and running. Contractors never accept risk. Instead they price it. In the industry, we often use the proverb: fix an error in design; it will cost you a euro. Fix an error in construction; it will cost you 10€. 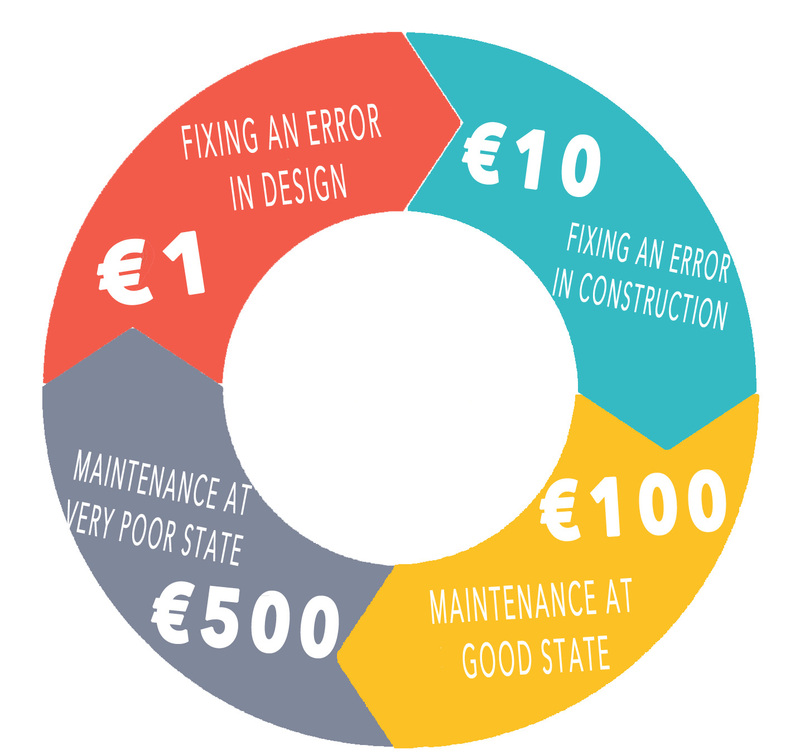 Fix an error in maintenance; it will cost you a 100 €. This means, that if the municipality tries to save money during the designing phase, by asking the designer to work less hours on their design, so that they can save a euro. They forget that they are actually risking 10 €, which they will eventually have to pay during construction phase, to fix the errors made during designing phase, because of hurried work. Similarly, if they try to save that 10 €, during the construction phase, they will eventually have to pay 100 € in the maintenance phase to fix that same error. 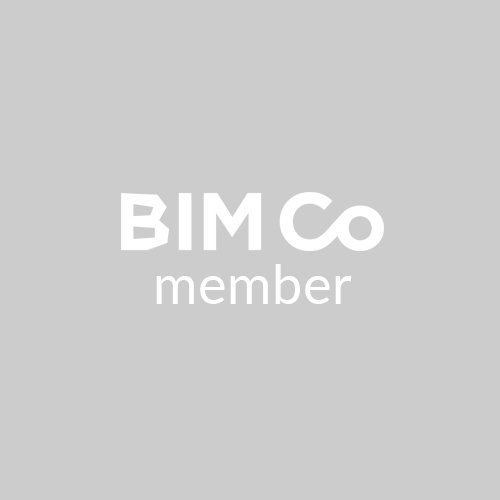 This industry insight is further validated by this research (international journal of technology enhancements and emerging engineering research), which has found, that when designers design unsound structures, and contractors construct poor construction. This eventually leads to structures that will experience need for total maintenance, within a very short span of time. How much does maintenance really cost us? In a report published by citylab; roads in America, need about $45.2 billion every year in maintenance, to keep them in a good state. But they currently only spend $16.5 billion in maintenance, while they spend a whooping $20.4 billion in new construction. Unsurprisingly, their older roads, bridges and other infrastructure are getting worse. And the new ones are approaching a state of repair. This clears one fact, that what we build today; we will have to maintain tomorrow. Therefore, just continuing to build more infrastructure, and that too with reduced quality as the municipality aims to do, will only add up to our miseries. Now if we couple this report with another study published by TCMA (best practices for infrastructure cost reduction strategies), which indicates that a road which required a dollar for maintenance four years ago, while it was in a ‘good’ state; will require five dollars four years later, when it reaches the ‘very poor’ state. This means that if we leave our infrastructure as they are today, without maintaining them. We are heading towards a tomorrow, that will need five times more investment to maintain the same asset, which required just one yesterday. Consider the below diagram, which is suggestive of how a simple error in design, that would only cost a euro to correct at the start, will lead to massive problems costing 500 times more. We can only imagine now, what the condition of our infrastructure will be tomorrow, if we continue to build with ‘cheapest is the best’ approach. And try to save on costs by reducing the quality of our design and construction. This approach will lead us to a future, which has the highest number of dilapidated infrastructure, which will need so much investment to repair, that it will be beyond our financial reach. The simplest solution to this problem, as we have seen above, is to aim to have the best quality at each stage of construction; be it design, construction or maintenance. This way we will ensure, that we gain maximum time, before our infrastructure reach a state of disrepair. And when they reach that state of disrepair, we repair them with best quality. At first, this approach might mean, that we won’t make savings the old harmful way; by cutting costs at every nook and corner. But let us not forget, that we will make massive savings in the maintenance stage, which as we have seen above bears the maximum cost in infrastructure. And more of, it is not that we cannot make savings in design and construction stages. We can. It is just that, we will have to change the tools we use to make those savings. The best way to do that - one that has no side effects - is by using information management tools like Infrakit. Many municipalities and construction companies have already successfully made substantial savings using these tools. The next organization to take home those massive savings could be yours. If you are curious about, how you could make enormous savings, and still have the best quality infrastructure. Read this detailed guide. Jero’s SASI (Solutions for all solutions in infrastructure). Jero’s SASI is a step by step guide, that will make you a pro in making savings in every project you undertake. To conclude, I would say that building the cheapest quality infrastructure to save money is the worst way to save money. Instead we should aim to build the best quality infrastructure, and aim to save money using information management tools, that guarantee +30% savings.